Our featured fan for this week is Pedro Alpiarca from Portugal. 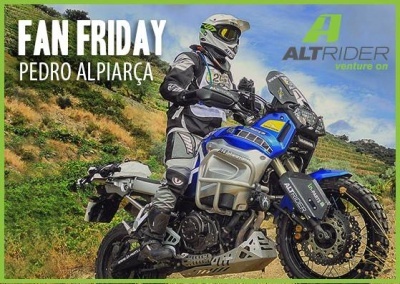 Thanks for sharing your AltRider story, Pedro! I had my first contact with Altrider in a motorcycle exhibition called Expo Moto in my hometown Lisbon, Portugal. I found the In-Parts stand as an excellent show room with a big trail featuring all the Altrider gear. It´s hard not to notice the difference in quality, the robust finishing and aesthetics as a different class on the market. I was searching to upgrade my safety/protection and luggage equipment as I intended to do more off-road use of my Yamaha XT1200Z Super Tenere. Once again, the priceless help and support from In-Parts made possible to fully dress the ST with Altrider parts, and since then I have done about 5000km in off-road use, sometimes in pretty gnarly conditions, with nothing but compliments to the quality of the material. Over the past 2 years since equipping my bike with Altrider parts, I've participated in multiple off-road challenges including, Lés-a-Lés Off-Road and Lés-a-Lés On-Road. In addition to several off-road non competitive navigation events such as Portuguese Dakar Series, Cirque du Jaffar and other lesser known tracks. I would like to point out that the Altrider material and luggage gear always performed at the best, and as you know, those big bikes tend to get us in to trouble..Proud owner and (most of all) user.